Games for kids. What can be made from matches? The game is for an even number of players. It can be played in any place — the figures can be laid out on the table, on the floor, on the sand and so on. Needed ten used matches for each player. Brain teaser questions and puzzles. Don't allow children to have match boxes while playing, only used matches. The players break up into pairs. One player makes a figure from matches, the other watches him. When the figure is laid out, the players turn back and try to repeat making the figure (even the match heads should be turned the needed direction). The players may break up into teams. They arrange how many figures and from what number of matches they will make them. Then one team lays out the figures and the other, turning back, reproduces them. For each figure reproduced correctly, the team gets one point. 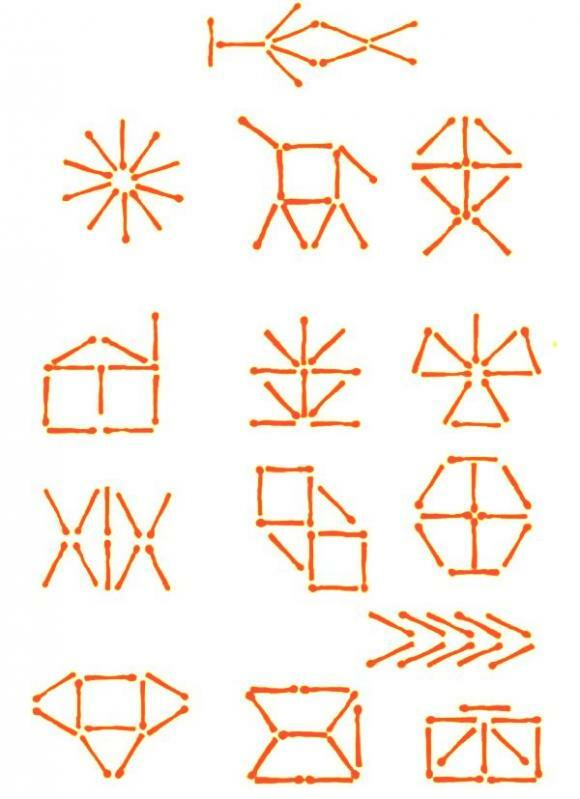 The pictures show some variants of figures from matches.